At last week’s Embedded World, we made two exciting announcements. 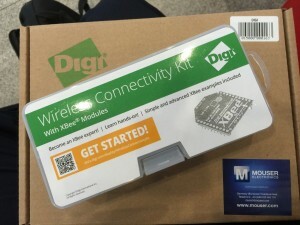 First off, this summer we’ll begin shipping the Digi ConnectCore 6UL development kits. 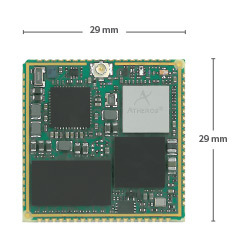 This tiny module, based on the NXP i.MX6UL processor, is just 29mm x 29mm. The CC6UL’s low-power consumption combined with high performance and easy wireless integration will make the module a true game-changer in the Industrial IoT space. More info on the Digi ConnectCore 6UL module is available here. 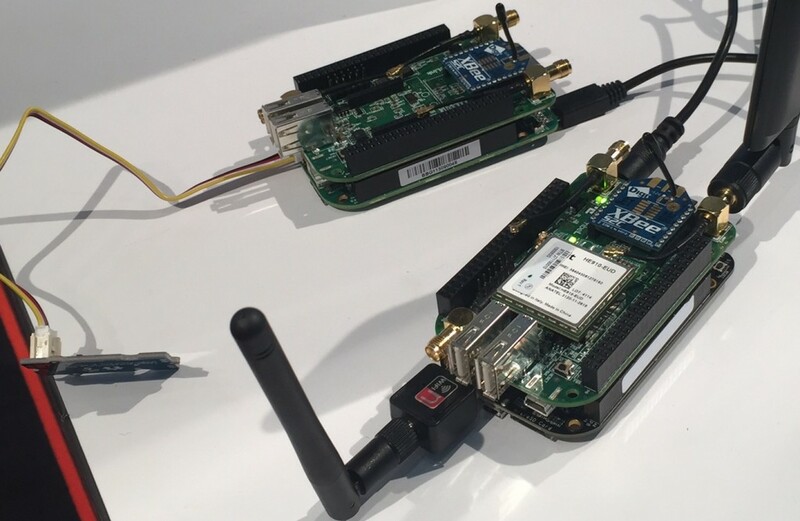 We also announced a new XBee module in order to support the emerging wireless protocol, Thread. The module will be made available this spring and allow our customers to start designing and testing Thread networks. Thread is an exciting new wireless standard created to improve network reliability, security and power efficiency. We are extremely excited about this new member to the XBee family. Click here to read more about Thread. In our booth, we shared the numerous ways our customers are using Digi embedded technology today. Featuring the Digi ConnectCore 6 module, we had our customers Fraser Nash and Furuno on display. Fraser Nash builds zero-emissions taxi cabs for the city of London, while Furuno provides a next-generation platform for commercial marine navigation. Watch the video below to see the Furuno demo in action. 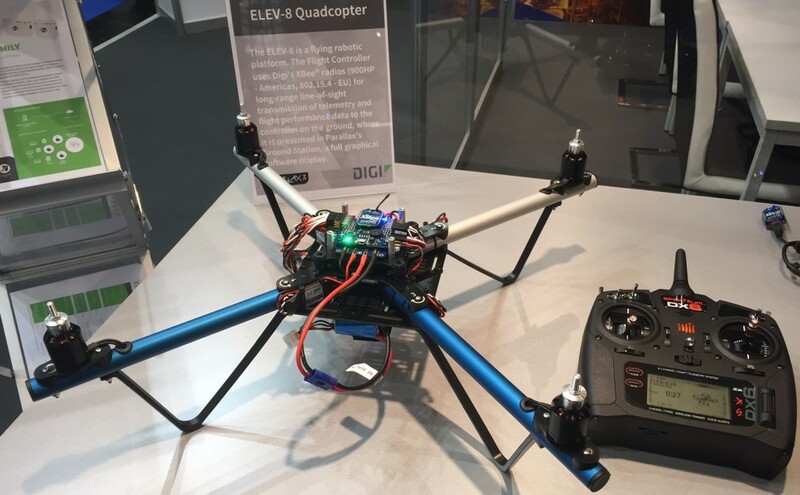 Another fun demo we had was the Parallax ELEV-8 Quadcopter. The quadcopter is equipped with an XBee based telemetry system. Along with the quadcopter, Parallax provides free software to graphically view data from the device such as battery voltage, pitch, orientation, throttle position, and much more. Attendees could power up the quadcopter, pick it up, adjust the throttle, and see all of the telemetry data streaming live on a laptop. As we explored the show floor we found an awesome IoT demo in the Digi-Key Electronics booth. It was a wireless sensor network application featuring XBee, Nimbelink cellular module, BeagleBone board, and the Exosite cloud platform. This was truly an end-to-end IoT solution from sensor to cloud. And just 5 steps away from that end-to-end IoT demo was a wireless charging demo which used XBee to send display information and charging status data between the two devices. Our partner, Mouser, held a development tool giveaway at their booth and one of the prizes was an XBee Wireless Connectivity Kit. Klaus Peitzch was one of the XBee kit winners and he has already started putting it to use! Check out his blog post where he shows how to get started with XBee enabled wireless communications. Thanks to everyone that stopped by at Embedded World. It was a valuable show for us and we enjoyed connecting with our partners and customers from around the world!